19-inch alloy wheels, automatic LED headlights, heated mirrors, a power liftgate, a sunroof, rear privacy glass, keyless ignition and entry, heated and ventilated eight-way power front seats (with driver power lumbar), driver memory settings, a power tilt-and-telescoping steering wheel, leather upholstery, tri-zone automatic climate control, an auto-dimming rearview mirror, rain-sensing wipers; LED puddle lights; rear-door keyless entry; GPS-linked and solar-sensing climate control, roof rails; front and rear parking sensors; remote engine start; auto-dimming sideview mirrors heated rear seats and rear-door window sunshades. Electronic features include twin console displays (7-inch touchscreen and 8-inch information), a multi-angle rearview camera, Bluetooth phone and audio connectivity, a navigation system, voice controls (navigation and audio), a rear-seat entertainment system with a 16.2-inch screen, an HDMI input, AcuraLink and a 12-speaker Acura/ELS surround-sound audio system with HD radio. 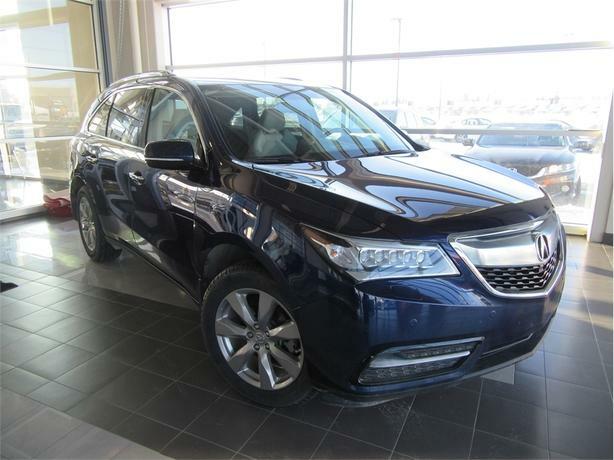 This MDX also hosts a frontal collision mitigation system, lane-keeping assist, adaptive cruise control, and blind-spot warning.